This active region of star formation in the Large Magellanic Cloud (LMC), as photographed by NASA's Hubble Space Telescope, unveils wispy clouds of hydrogen and oxygen that swirl and mix with dust on a canvas of astronomical size. The LMC is a satellite galaxy of the Milky Way. This particular region within the LMC, referred to as N 180B, contains some of the brightest known star clusters. The hottest blue stars can be brighter than a million of our Suns. 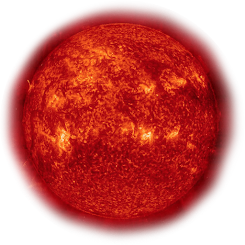 Their intense energy output generates not only harsh ultraviolet radiation but also incredibly strong stellar "winds" of high-speed, charged particles that blow into space. The ultraviolet radiation ionizes the interstellar gas and makes it glow, while the winds can disperse the interstellar gas across tens or hundreds of light-years. Both actions are evident in N 180B. Also visible etched against the glowing hydrogen and oxygen gases are 100 light-year-long dust streamers that run the length of the nebula, intersecting the core of the cluster near the center of the image. Perpendicular to the direction of the dark streamers, bright orange rims of compact dust clouds appear near the bottom right of and top left corners of the image. These dark concentrations are on the order of a few light-years in size. Also visible among the dust clouds are so-called "elephant trunk" stalks of dust. If the pressure from the nearby stellar winds is great enough to compress this material and cause it to gravitationally contract, star formation might be triggered in these small dust clouds. These dust clouds are evidence that this is still a young star-formation region. This image was taken with Hubble's Wide Field Planetary Camera 2 using filters that isolate light emitted by hydrogen and oxygen gas. To create a color composite, the data from the hydrogen filter were colorized red, the oxygen filter were colorized blue, and a combination of the two filters averaged together was colorized green. The amalgamation yields pink and orange hydrogen clouds set amid a field of soft blue oxygen gas. 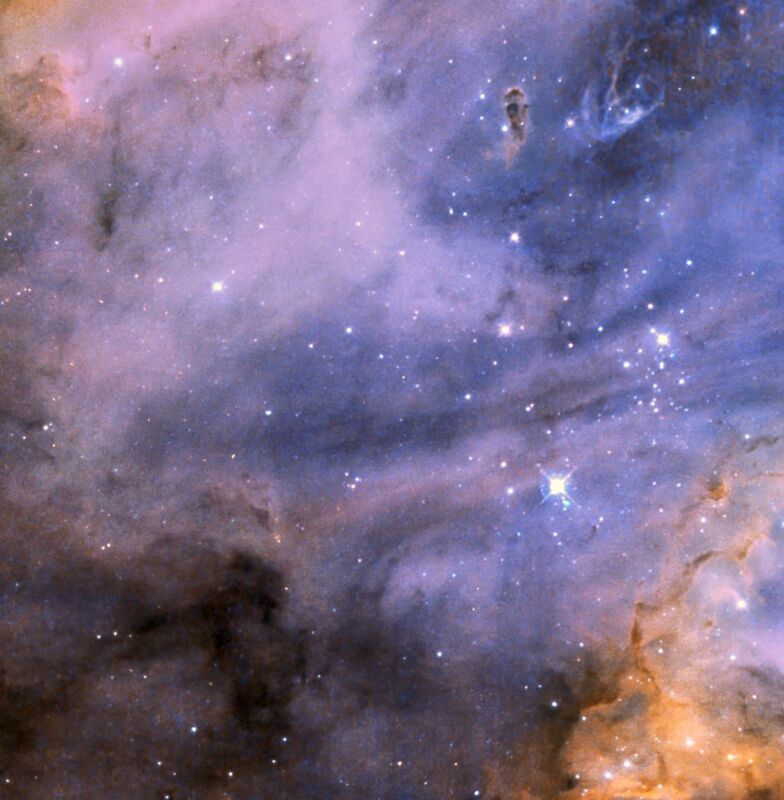 Dense dust clouds block starlight and glowing gas from our view point.